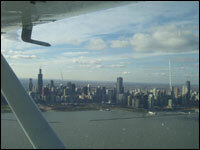 My Flight Blog: General Aviation a Threat to Our Cities? General Aviation a Threat to Our Cities? In addition to maintaining this blog I also contribute for Chicagoist.com. There I concentrate on covering sports but from time to time I will post an article about aviation as it relates to Chicago such as the Air and Water Show or in yesterday�s case about general aviation restrictions around major cites like Chicago. In the aftermath of the tragic aviation accident involving Yankees Pitcher Cory Lidle and his flight instructor, Tyler Stranger there has been a ton of negative press for General Aviation. Many are asking whether General Aviation should be more closely restricted around our big cities. For Chicagoist I wrote my opinions on the matter. I was happily surprised to see that I received many positive comments in reply to my post many who realize this was an accident but not much more. Having flown the Hudson River Corridor, safely, this past Spring I would hate to see unnecessary restrictions put in place that would prevent such flights in the future. I invite you to check out the article on Chicagoist.com.